Sometimes I make spaghetti squash with meat sauce for dinner. It’s good… it’s fast and easy. But it’s not the stuff dreams are made out of. Paleo pasta, now that’s the stuff dreams are made out of. 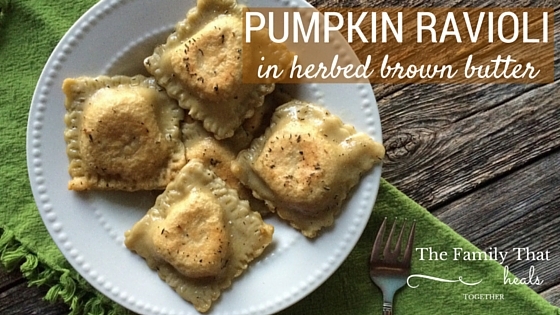 Pumpkin ravioli in herbed brown butter is. the. stuff. dreams. are. made. out. of. I know this because I’ve literally been dreaming of making this for weeks, but I’ve put it off because it seemed intimidating! I’ve never made pasta before, after all, not even with wheat flour. I’m still in awe that I even made this. Which just goes to show that it’s not as hard as it looks. How did I paleo-fy pasta, you ask? I’ve been playing with an amazing new flour. You’ve probably heard about it because it’s suddenly all the rage in the paleo world, and I’m here to tell you that the hype is legit. Cassava flour is my new favorite, for obvious reasons. Like the fact that you can make pasta from it. This is a big deal for me because I don’t eat a lot of almond flour. Besides the fact that cassava flour has an awesome flavor and texture like that of wheat flour, it is nut-free, so I’m sold. I used Otto’s Naturals cassava flour, and have not tried any other brands. Read here about why I chose Otto’s Naturals! Ok, enough about the ingredients, let me tell you how it’s done. Place all ingredients in the bowl of a stand mixer and mix with the paddle attachment for ten minutes. Alternatively, you can mix it together by hand until it’s well combined. Once the dough has formed a nice ball, turn it out onto your flour surface and roll it out to 1/8-1/16″ thickness. Using a square-shaped cutter (I happened to have a scalloped-edge cookie cutter like this), cut 24 squares. You will have to ball the scraps back out and roll them out several times until you run out of dough. With this amount of dough, I was able to cut exactly 24 2.5″ squares for some jumbo raviolis. Once the raviolis are cut, make the filling. Start a medium-sized pot of water boiling. Mix the pumpkin puree and cream cheese together by hand in a medium-sized mixing bowl. Pinch the thyme between your fingers as you drop it into the mixture, grinding it between your fingers to release the essence. Add the salt and garlic powder and combine well. Using a pastry brush, brush water on the edges of each square of dough. Scoop one tablespoon of the pumpkin filling onto 12 of the squares. Place the empty squares, one by one, on top of the squares topped with filling, pressing the edges together as you go. You can go back and press the edges with a fork to better secure them. Using a slotted spoon or spatula, place about half the raviolis in your pot of boiling water. Let them cook for about 6-8 minutes, stirring them a few times to be sure they don’t stick. 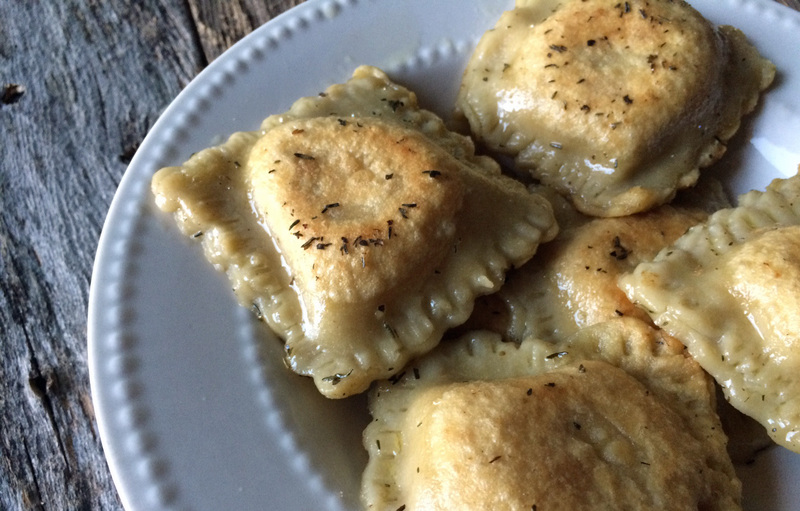 While the first batch of raviolis are cooking, prepare the herbed brown butter. Melt the ghee over medium heat in a large skillet. Add the salt and thyme. Once the first batch of raviolis are done in the boiling water, using your slotted spoon or spatula, transfer them to the hot ghee. While the raviolis are cooking in the brown butter ghee, put the second half of the raviolis in the boiling water. 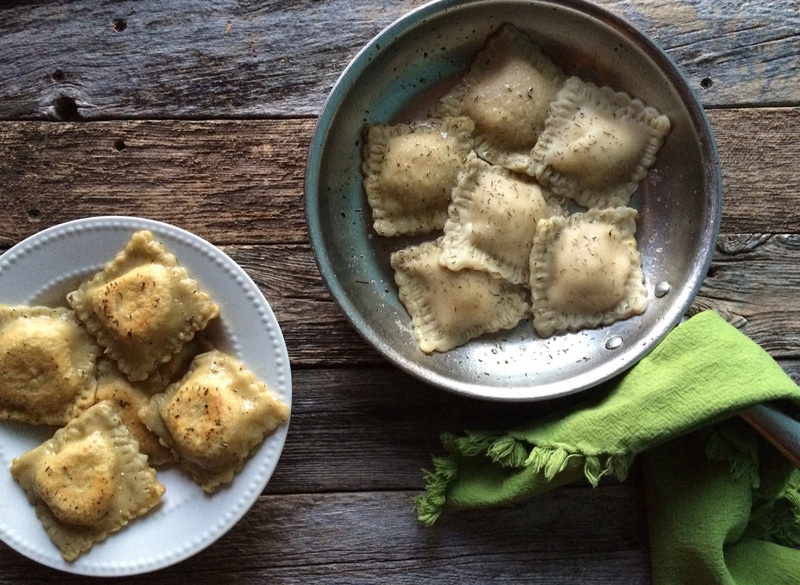 Cook each ravioli for a 2-3 minutes per side, then transfer to a plate for cooling. Once the second batch is done in the boiling water, cook them the same way in the ghee, then remove from heat. Drizzle any leftover ghee mixture over the finished raviolis. 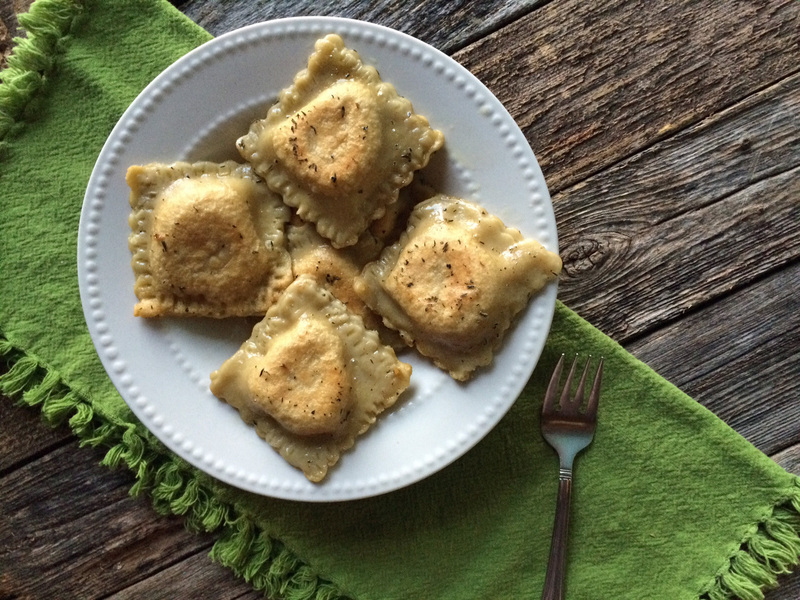 I never in a million years thought it would be possible to make paleo ravioli! Im super excited that it is intact possible, and it looks incredible! This looks so good! 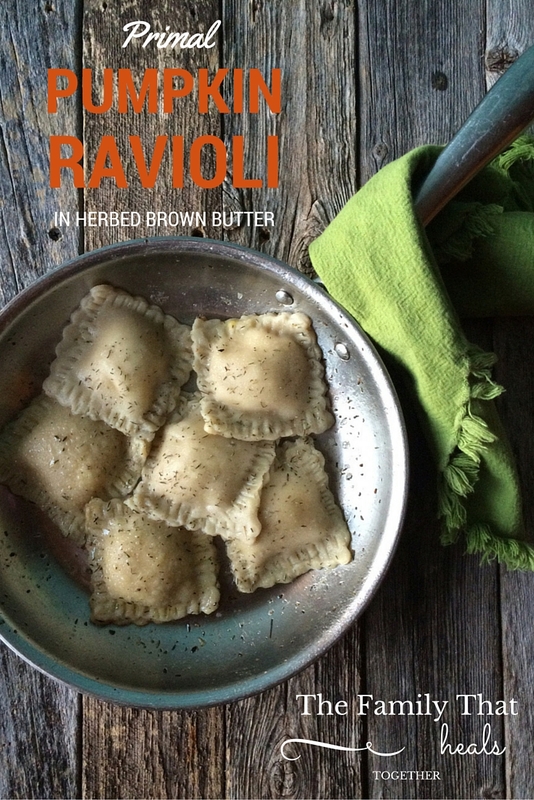 This is my favorite kind of ravioli but I haven’t had it in so many years since most pasta is not gluten free. I love that your version is Paleo! Thanks for sharing this with us. Pinned and sharing later today. They look amazing! How did you find the texture of the dough? Was it difficult to work with or better than expected? Also, how did you find the texture of the final cooked ravioli? So curious to make it now.